SCOTTSDALE, Ariz. – According to a recent survey, active adults aren’t slowing down. 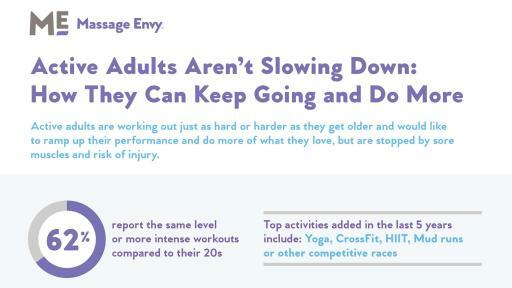 The survey found that 62 percent of adults ages 30-49 continue to work out as much – and with the same or more intensity – as they did in their 20s. More than half would like to ramp up their performance and do more of what they love, but are stopped by pain and the risk of injuries. Massage Envy’s new, proprietary assisted stretching service, called Total Body Stretch, is designed to help people perform at their best, ease the muscle pain and tension that comes with activity, and resist injuries. Developed for Massage Envy by an acclaimed chiropractor, massage therapist and ergonomist and performed by a stretching professional, the Total Body Stretch service is built around the company’s proprietary Streto Method, a sequence of 10 targeted stretches designed to increase flexibility, mobility and performance. 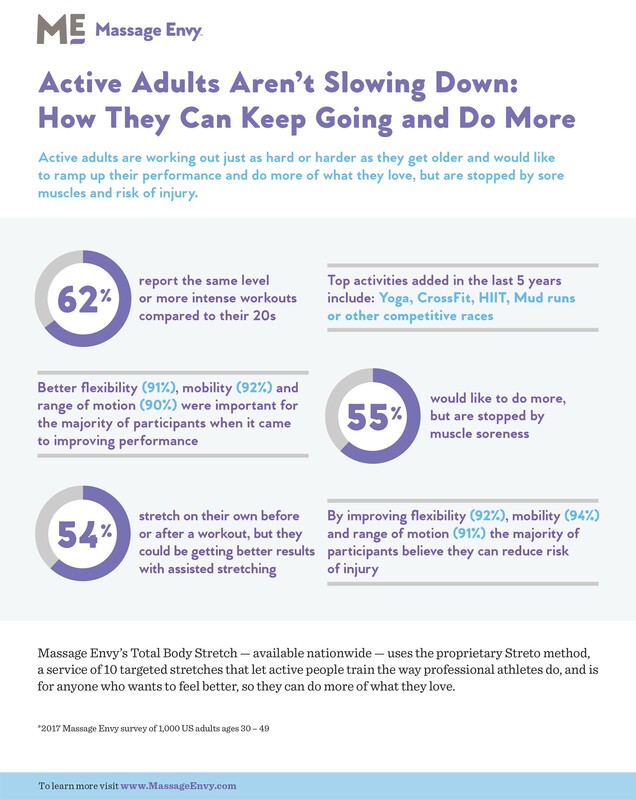 Of active adults who participated in the survey, 39 percent said they stretch on their own, but they could be getting better results. Assisted stretching, done with the help of a professional service provider or stretching “coach,” lets muscles move beyond their natural resistance, creating a deeper, more effective stretch. It is proven to increase range of motion, flexibility and blood flow and improve how muscles function, and virtually every professional and elite athlete uses assisted stretching in their training and conditioning routines. The company introduced Total Body Stretch last month by announcing a 4-year partnership with the PGA Tour, sponsoring the Tour’s Player Performance Centers. These trailers travel to the PGA TOUR and PGA TOUR Champions event locations to provide mobile training and wellness services to Tour players to help bring awareness to the benefits of assisted stretching. Total Body Stretch is available to members and guests of the company’s more than 1,150 franchise locations across the country. Service providers recommend Total Body Stretch as a standalone 30- or 60-minute service, and also as a complement to a massage session. An online survey was conducted within the United States by Propeller Insights on behalf of Massage Envy. 1,000 adults between the ages of 30 and 49 who exercise or are physically active three or more times each week were surveyed. The survey was conducted in June 2017. Massage Envy, based in Scottsdale, Arizona, is a national franchiser and, through its franchise locations, is the leading provider of therapeutic massage and skincare services, and now offers a proprietary assisted stretching service, Total Body Stretch. The Massage Envy franchise system is, collectively, the largest employer of massage therapists and estheticians, with more than 35,000 dedicated wellness professionals that provide best-in-class service to over 1.65 million members. Founded in 2002, Massage Envy has more than 1,150 franchise locations in 49 states that have together delivered more than 100 million massages and facials. For more information, visit www.massageenvy.com, or follow us on Twitter @MassageEnvy and Facebook www.facebook.com/MassageEnvy.